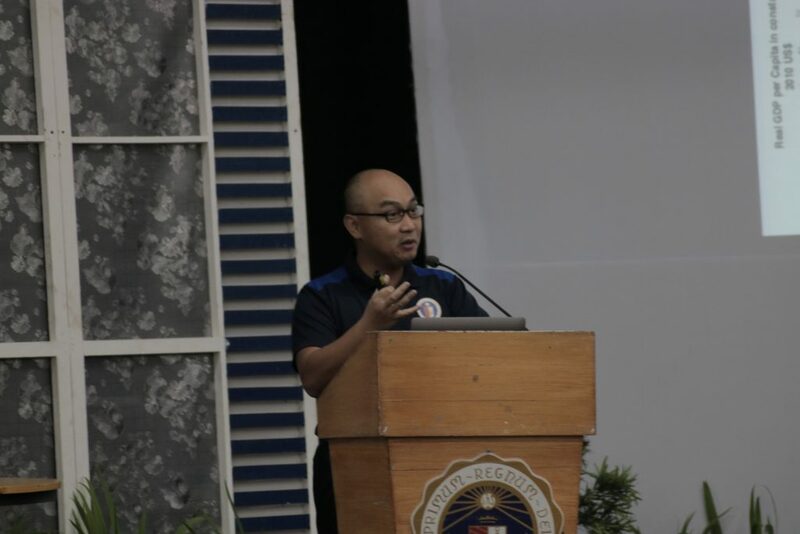 Dr. Ronald U. Mendoza, Dean of the Ateneo School of Government, expressed optimism amidst several critical issues of the country during the National Situationer Update on 25 January 2019 at the Fr. Godfredo Alingal S.J. Multipurpose Hall, Ateneo de Naga University. A former Senior Economist with the United Nations, Dr. Mendoza started the lecture by showing an overview of the economic situation of the country from the 1960s until the present. He observed that although our country doubled its Real GDP per Capita, it was insignificant compared to the six-fold or seven-fold economic growth experienced by other ASEAN countries, such as Malaysia and Indonesia, in the same time frame. Dr. Mendoza further mentioned that economic growth is not inclusive since the decline of poverty rate in the country is slow as compared to some neighboring countries, which have reduced the poverty rate significantly. Therefore, the inaccessibility of investments to most Filipinos causes imbalance in the economic growth. The majority of Dr. Mendoza’s talk concentrated on the key issues faced by the Philippines and the corresponding solutions being applied by the government: elimination of illegal drugs and crimes, promotion of food security, public finance reforms, and deep governance challenge; he also reviewed whether the solutions are appropriate to the corresponding issues. 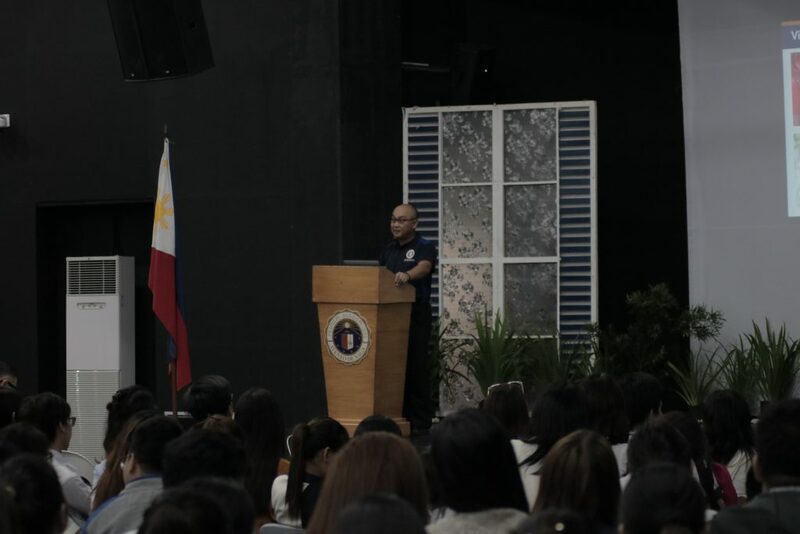 Dr. Mendoza noted that the government has presented at least two solutions to the problem of crime and illegal drugs, among them –Tokhang or the killing of alleged drug-pushers and the lowering of the Minimum Age of Criminal Responsibility. He countered that the proposed solutions are in fact not effective since illegal drugs are still entering our country and crime has not gradually diminished. He offered that international evidence and research prove contrary to the belief of the government in using such methods. The second key issue Dr. Mendoza discussed is promotion of food security, given the price inflation of the country’s main food, rice. He described the country as “not being blessed to produce rice in a cost-effective way.” He clarified the misconception that the shortage of NFA rice supply and the price hike would be beneficial for farmers in terms of revenue increase because of the rise in demand, rather it was more advantageous for the retailers who were able to increase their profit. With regard to public finance reforms, Dr. Mendoza asked the audience “Sino ba ang masaya na magbayad ng buwis kung nakikita niya na maraming pera ang nasasayang?” He explained that TRAIN Law was supposed to update our tax system, and to generate revenue to support and help the poor but there are problems relating to the spending aspect wherein funds were not able to reach the said sectors. In relation to the increase of the prices of goods, he suggested that the government should have taken steps in implementing properly the TRAIN Law especially to help ease the burden on the people. On the political situation of the country, Dr. Mendoza identified the proposed shift to federalism as one of the main issues to be discussed. “Ang paglipat sa Federalism ay dapat pag-aralan at ‘wag madaliin kagaya ng sa TRAIN Law,” he asserted. He specified that features which were previously removed by Congress like the term-limits and anti-dynasty law should still be included in the proposed charter change. Lastly, Dr. Mendoza discussed the status and effects of political dynasties in the country. He presented a data collected by the Ateneo School of Government showing an increase in the number of local officials coming from political dynasties from 2007 elections to the 2016 elections. The more member of a family who are elected in public offices, the more they have control over public finance, and have more influence on business and investments that enter in their respective territories. He then questions why poverty is still present and increasing in provinces wherein political dynasties exist despite the growth of the national economy and the continuous distribution of money to these areas. He advised the students to not be swayed by known candidates or by familiar faces, but rather look at the credibility of the candidates; he urged to take a look at alternative candidates who might be able to present ideas which might benefit and change the community and country. Dr. Mendoza urged the participants “to not only inform themselves, but also others who do not have access to this information, and to multiply it to others, then something might happen and things (poverty and corruption) will gradually disappear in our country” before ending his talk. In the open forum, many professors, staff, and students clarified or asked questions pertaining to the issues discussed and relevant to the situation of the country. There were some who asked the opposing sides of one issue, which impressed Dr. Mendoza, stating that debating on issues is something needed in society and that people should also listen respectfully to the stands and beliefs of others without being indifferent. The activity was organized by ADNU’s Office of Student Affairs, with the support of the Office of the President, and the Office of Mission and Identity. 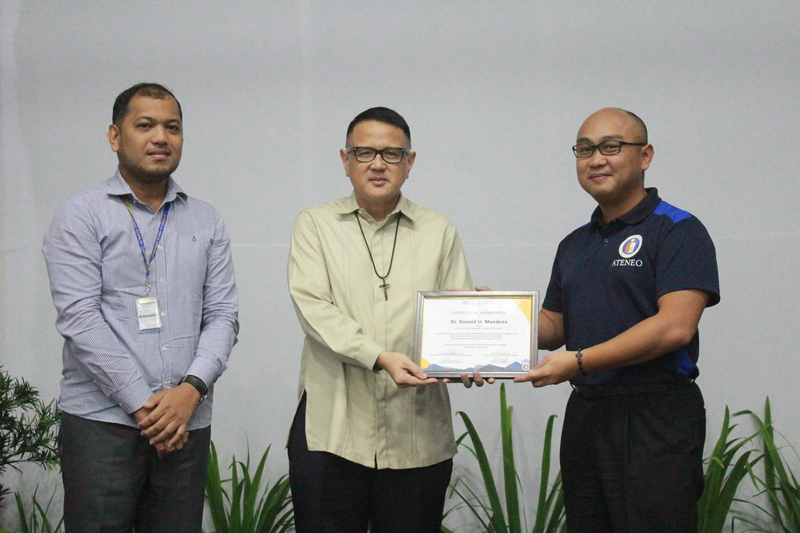 It was part of this year’s Ateneo Leadership Development Program for student leaders and organizations.